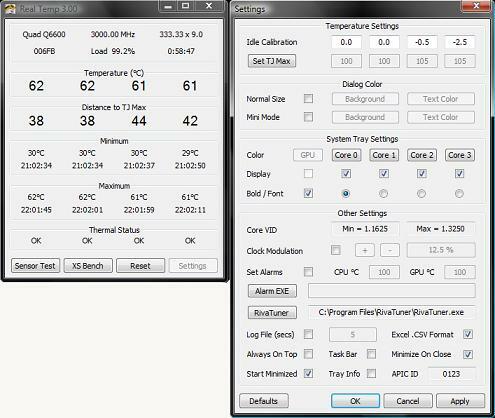 CPU does produce heat when it is operating. If the heat produced from the CPU is excessive without proper cooling measures adopted, it will affect the computer’s performance substantially. To optimize the computer’s performance and keep it running properly, users would have to monitor the temperature of their CPU and other computer components. Users who are using Intel processors can try out Real Temp, a temperature monitoring program designed particularly for all Intel single Core, Dual Core, Quad Core and Core i7 processors. Technically each core on these processors has a digital thermal sensor (DTS) that reports temperature data relative to TJMax (Temperature Junction Max) which is the safe maximum operating core temperature for the CPU. As the CPU heats up, the Distance to TJMax will decrease. If it reaches zero, the processor will start to thermal throttle or slow down, so maximizing the distance away from TJMax. By controlling the TJMax, it helps the computer run at full speed and more reliably, too. More computer, CPU and GPU temperature, voltage and fan speed monitoring and viewing tool available.